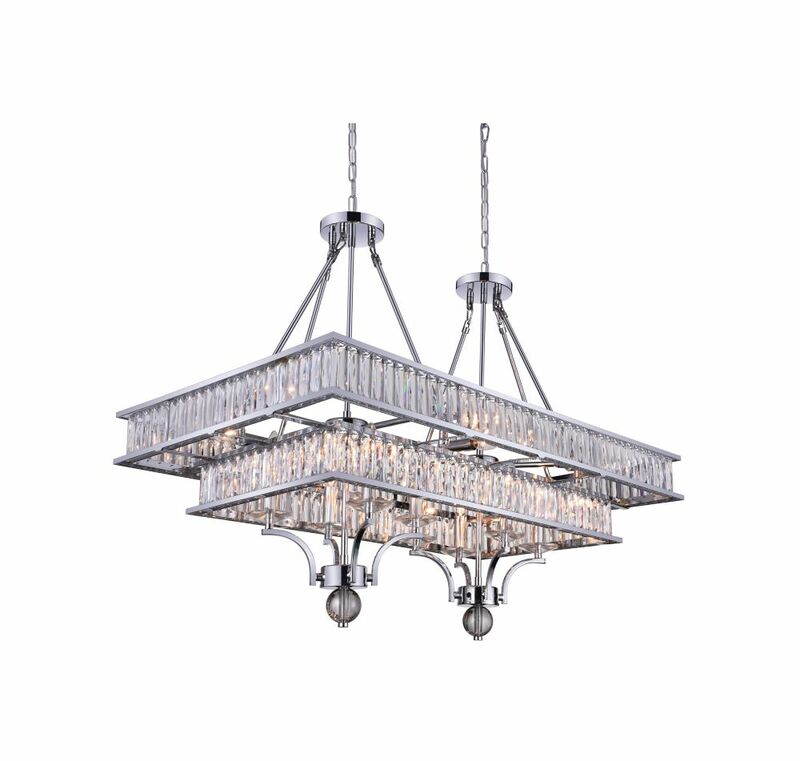 This breathtaking 16 Light Chandelier with Chrome Finish is a beautiful piece from our Shalia Collection. With its sophisticated beauty and stunning details, it is sure to add the perfect touch to your dicor. From the unique Edison light bulbs to the warm colour tones, the Affilato fixture is the missing piece to your home. The seeded glass provides a softness to the industrial fixture. The three colour tones (black, dark brushed silver and brass) provide depth and warmth. Dramatic dark lines surrounding brass wire cage cylinders unveils a strong geometric shape. Multiple dimensional layers weave together a web of various shapes stylishly spaced out to create an airiness and add the illusion of weightlessness. Rich colours make this a truly luxurious fixture, contrasting the bright shiny brass against the dark matte black. Rich, intricately blown amber glass pendants arranged from flowing crystal beading transcends the mundane. The Cascata is a unique piece that catches and reflects light in such a way that it seems to be constantly shimmering. Adds an elegant air to any space. Shalia 37-inch 16 Light Chandelier with Chrome Finish This breathtaking 16 Light Chandelier with Chrome Finish is a beautiful piece from our Shalia Collection. With its sophisticated beauty and stunning details, it is sure to add the perfect touch to your dicor. Shalia 37-inch 16 Light Chandelier with Chrome Finish is rated 1.0 out of 5 by 1. Rated 1 out of 5 by Benmichigan from Disappointed for the price Let's start by saying it is beautiful. However the bracket support system is extremely weak and the chandelier is extremely heavy. I recessed the bracket into the drywall all the way to the Box and the weight of the chandelier still manage to bow the bracket and leave a gap from the ceiling. I'm afraid of this falling because of I'm afraid of this falling because of how weak the bracket is I have seen $600 chandeliers with triple more heavy duty steel and the one provided here and a larger bracket. The chain they provide also has different sized links within the same chain so no matter how many X you count the number of links when you shorten it one side will stay lopsided. even after even after I managed to get the chain the same length it was still on even to the level and when I measured everything I find out that from the bottom to the top of the chandelier of the two main supports are different lengths. The actual chandelier is heavy duty and beautiful but a lot of the dimensions are off and a lot of the arms are off level and very noticeable and the steel is too thick to bend properly back into place. I understand not everything can be perfect but this is ridiculous for a $1,200 Chandelier.